This course offers a great opportunity to give veterinary medicine a try and a way to earn money for college with the skills you acquire from this program. 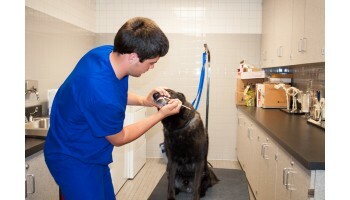 Take what you learn in Pet Health & Grooming to the next level and train for the unlicensed Veterinary Assistant field. Build upon your skills in animal handling and restraint, health and safety procedures, sanitation, surgical preparation, anatomy, physiology, medical terminology, infectious diseases, instrument and equipment identification, vaccine preparation and injection techniques, law and ethics, and veterinary office procedures. High school students must have a â€œCâ€ or better in Math and Science. Must have completed Pet Health and Grooming with a Certificate of Competency. Patrick E. has successfully found employment as a Pharmacy Technician after completing course(s) in Pharmacy Technician.